Lost in the Movies (formerly The Dancing Image): Neon Genesis Evangelion, Episode 17 - "Fourth CHILD"
Neon Genesis Evangelion, Episode 17 - "Fourth CHILD"
Neon Genesis Evangelion constantly reminds us that it's about childhood...and adulthood, how the two categories overlap and yet stand worlds apart. This tangle spreads far beyond the usual confusions of adolescence. The children are exploited and endangered (to put it mildly) by their elders, forced to grow up too quickly. And the adults, burdened with professional responsibilities far beyond their youth, seem unable to establish any true stability in their personal lives. But if the adults deal with its confusion through bureaucracy and suberterfuge, emotionally distancing and isolating themselves from the outside world, the children have not yet learned these skills. This is their weakness - and their redemption. Evangelion has frequently used the interactions of Shinji, Asuka, and Rei to demonstrate this double-edged sword, and that trend continues in this episode. Shinji can earnestly clean up Rei's room one moment, and blush with shame when he's teased for bickering with Asuka. For all her brashness, Asuka too blushes when Toji clucks about them being a married couple. And there must be something in the air, because Rei's cheeks grow rosy when she discovers Shinji cleaning her room. She stutters, "Thank you?" and later lies in bed asking herself why she expressed gratitude, something she has never done even with the senior Ikari. These teens wear their emotions on their sleeves: they are as exposed in public as they are shielded inside the Eva. In addition to these familiar social fumbles, episode 17 emphasizes two other characters: the "fourth child" of the title, Toji, elevated from sidekick to potential Eva pilot, and class rep Hikari, whose hectoring style gives way to a blatant crush on the indifferent jock. These students face adult responsibilities, ranging from piloting a colossal military weapon all the way to cooking meals for several siblings, but they greet them without guile, even if the usual adolescent challenges leave them speechless. The same cannot be said of the actual adults in this episode, who are only beginning to reveal - or discover - the web in which they are entangled. 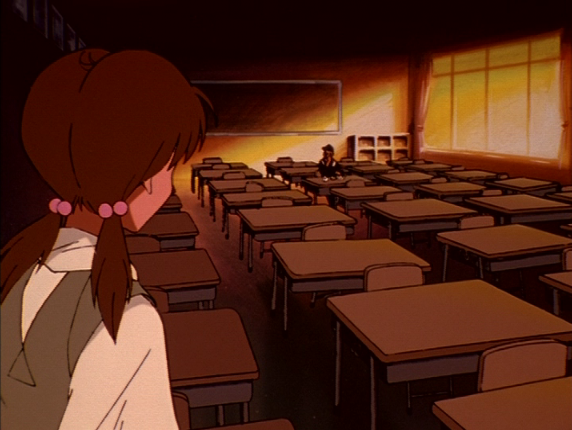 We open with Misato being questioned by the bullying, intimidating SEELE group. When she tries to question them, they immediately shut her down. Kaji continues to cagily reveal his cards, telling Misato that the Marduk Institute, which supposedly screens for the "proper" 14-year-old pilots, is a front for NERV (suggesting that the science used to justify this child labor is corrupt). Their exchange is testy, a mixture of aggressive flirtation, distrustful professionalism, and conspiratorial camaraderie. But at least it's an exchange. Ritsuko, on the other hand, keeps to herself: only we hear her thinking about the danger of the Evas and observe her dark, silent, dare-we-say jealous reaction to Cmdr. Ikari's enthusiasm for Rei. Secrets are everywhere in this episode: in fact, we're never even told who the "fourth child" will be (though it's impossible not to guess by the episode's end, or even its beginning for that matter). me: A quiet episode, although unlike some of the earlier quiet episodes it's clearly setting the groundwork for something big. Bob: Yeah. It's certainly a catch-your-breath episode after the last one. Which is interesting because the last one, Splitting of the Breast, is really kind of an overture for this whole arc. The past few episodes have definitely been very much about linking the Angels and the human mind. When the Angel in Lilliputian Hitcher hacks into the Magi, it's essentially hacking into the mind of Ritsuko's mother. That whole episode really cements a lot of imagery linking brain and technology, which comes back again when we see Rei in the tank. And then there's the whole crux of the Splitting of the Breast episode, the Angel trying to commune with Shinji, which is something the SEELE people are really concerned about. The Dummy Plug represents something in common with these things-- a focus on the human mind. me: Yes, and the opening scene with Misato addresses this question of what the Angels know - or want to know - about the human mind though I don't think it plays out so much in this episode. Bob: Well, it isn't what the Angels know about mankind, but the shared interest they and NERV have. What NERV is doing with the Dummy Plug is similar in spirit to what the Angels were doing. me: The dummy plug is - ostensibly anyway - a simulation of the human mind, right? So in that sense it poses a different problem than the idea of Angels wanting to reach the human inside the Eva. It's supposedly moving in the opposite direction, right? Bob: To an extent, yeah. The Dummy Plug is meant to replace the human pilot. But remember, it's all about connecting the human software to Eva/Angel hardware. And it's not for nothing that in the past few episodes we've gotten more confirmation that the Angels and the Eva are essentially one and the same. me: But with the Dummy Plug the IDEA (or at least how it's presented) is that the human mind is being replaced rather than connected to, right? Or am I missing something? Bob: You could say that the Angels may be trying to create a more holistic bridge between themselves and humanity, while NERV/SEELE have always been trying to kind of hotwire themselves into the Angels for their own purpose. That's what the Evas are, really-- an ugly bio hack. And really, the Dummy Plug isn't even a copy of the human mind-- it's a copy of a copy. It's just showing how the Angels are doing it naturally, holistically, while humanity is really trying to force it. That's what Instrumentality is in the long run-- forcibly engineering a strange and terrible new aeon, to quote Crowley, I think. me: In some ways, Toji and Hikari are the main characters here. You mentioned at one point in the past really not caring at all about Toji's character. Do you still feel the same about him (and, I guess by extension, Hikari)? Bob: Sorta? I mean, he's a character who seems to function best in others' stories. Even his best characterization, I think, is his devotion to his wounded sister, which is usually lost whenever Misato walks by and turns him into an erection with legs. Beyond that, his role here is going to quickly turn into his real purpose in the rest of the series. I do like how they sort of ingratiate him into the story by having him join Shinji at Rei's apartment. It's sort of an initiation ritual for the Eva pilot. me: I actually thought Rei had more of a role in this episode than Asuka. They almost had to struggle to find her some business this time around. A real change from her very long streak of being center stage. Bob: To an extent. They lean heavily on her Kaji crush to provide an excuse for her to find out who the Fourth Child is. I like how they handle it, though. She has to force herself to put on a cute face to go meet him. She has to try and play up to the "Asuka in Kaji" that she thinks he would like. As opposed to simply being herself, which she always is with Shinji. me: It's well-done, just a surprise that her role has suddenly become so flimsy. Makes a lot of sense in the grand scheme of things of course. She made a big splash on entry but increasingly she is realizing she isn't so important in the scheme of things...a great blow to her self-esteem. Bob: I love the cut from "the married couple" Shinji and Asuka yelling to Ritsuko's "married couple" cat salt and pepper shakers. The series always has some great cuts like that. 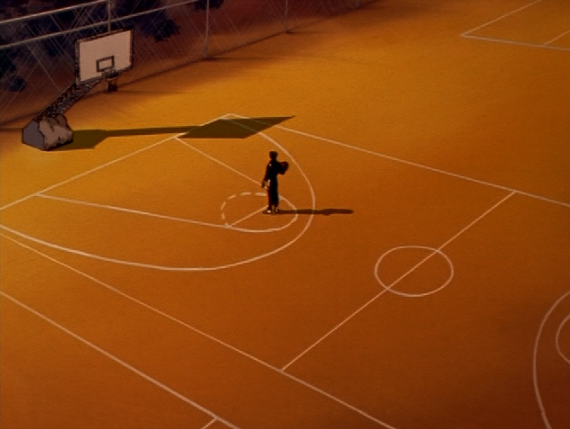 There's a lot of emphasis on dreams deferred in this episode. Asuka gets another brush off from Kaji. Hikari gets a brush off from Toji. Kensuke isn't gonna be the next Eva pilot. Toji is, but probably doesn't want to be. me: A lot of brush-offs...and a lot of blushing. Bob: Something that I thought of while watching the other episodes is how there's never really any clear indication of where the Angels seem to come from. You just kinda assume they're from space. But every time an Angel appears, they seem to just materialize out of nowhere. They seem to come from the sea, more often than space. In that sense, the location of the US base [close to "Area 51"] is more of a substantial clue than just casual genre toss off. me: Great point. The one with the giant eyes comes from space. But otherwise yeah just boom! There they are. Bob: Though I'm always rather partial to the idea that the Angels aren't an entirely alien thing, and that they're more akin to spiritual beings from myth. They occupy a different material plane entirely, and just shift onto ours when the time comes. me: Sounds a bit like the whole Twin Peaks thing. Are they interdimensional creatures appearing to our eyes in human form, are they essentially divinities/gods - spiritual energies personified, are they manifestations of the human psyche given independent life, or are they from that wacky planet of creamed corn? Bob: I'm also reminded of the way some writers treat the Cthulhu mythos. Are they from another planet, or another dimension? Are they truly aliens, or Gods? And of course, it's no coincidence that the Second Impact begins in Antarctica. me: This episode is pretty economical. Especially in the beginning, or maybe that's just where it struck me most. Visually economical I mean. Or not even economical really, just very spare. Bob: Spartan. Kubrick is a big influence. me: You don't think it's a budget issue this time? Bob: Well, in Rei's apartment it is, sure. And in some repeated shots throughout. But this is also an episode that's mostly just building up to the next one. So it can afford to restrain itself. One thing that's purposefully spartan, I think, is the Dummy Plug itself, to bring things full circle. It looks very utilitarian. You have no idea what it's for, what it's going to do. It just looks like a different plug. me: One of the themes that struck me here is the contrast between the adult & kids' worlds. Obviously that's a persistent theme of NGE (as well as, at times, the surprising overlap between them - inasmuch as the kids are shouldered with heavy responsibilities, and the adults are often irresponsible in personal if not professional matters). But in this episode the contrast seems especially stark. All the blushing flirtation among the students, their emotional forthrightness, contrasted with the cagey withholding, bartering, and bureaucratic doublespeak going on with the NERV folks. Maybe the contrast is even more stark because we hardly ever see the kids in their Evas, whereas the adults are always on the job. 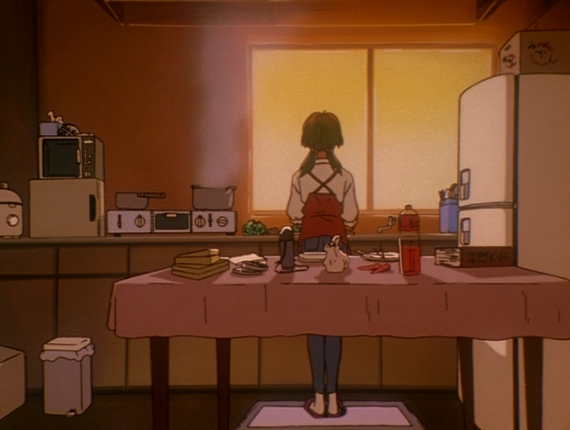 Bob: I think the deepest scene there is when Shinji seems to break through to Rei, saying thank you to her. It's a neat intersection of it all, because she's both a child and adult, and it's really the closest anyone's gotten to her so far. me: Misato factors in as NERV commander here but not so much as a bridge between the kids & NERV, right? Other than a couple remarks, one in the beginning, one when they're performing tests. It seems like there's a lot of separation between the generations this time. Bob: And yet we get that scene with Kaji and Shinji. Maybe he's the most immature of them. Maybe he's the one who's really able to connect with people the most, which makes him the best one to talk to Shinji right now. And maybe it's just the usual TV trope of mixing and matching characters to see how they interact, especially with the sped up timeline here. What's interesting is how that scene really helps make Shinji a main character here. This episode is really part one of his latest arc, which continues in the next two. me: Do they ever actually say Toji is the fourth child in this episode? It's obvious from the first time the concept comes up, and by the ending it's more than obvious - but is it ever actually seen/spoken? me: It's a nice technique, makes us feel the pressure on him - and a bit of an atmosphere of doom - in perhaps a more distinct way than if it was just addressed point-blank. Plus it contributes to the idea that maybe it doesn't matter who the fourth child is - especially now that we know the Marduk Institute is a sham. Bob: Right. Any one of those kids could be it. If there was any criteria for him being chosen, it's probably some kind of emotional hostage taking with his sister as a bartering chip. me: Remind me: what exactly is SEELE's "perceived" relationship to NERV? Bob: Ha, God I really have no idea.It doesn't help that their letters don't actually stand for anything. Long story short, SEELE is in charge of NERV. NERV is ostensibly a UN agency. SEELE, I dunno. me: And apparently Misato knows this. It's just interesting to think she's had no real involvement till now and all of a sudden these creepy weirdo old guys with bizarre hairdos and voices and different color lighting around them are asking her all these questions and ordering her around...If she wasn't having a crisis of faith before, she will be now! Last week, I added Murderous Ink's comment a few minutes after the rest of the post. So if you read it right away, you may have missed what he shared: an excerpt from an interview with Hideaki Anno discussed the Aum Shinrikyo terrorist group - make sure you check it out now. Next week: "Ambivalence" • Previous week: "Splitting of the Breast"